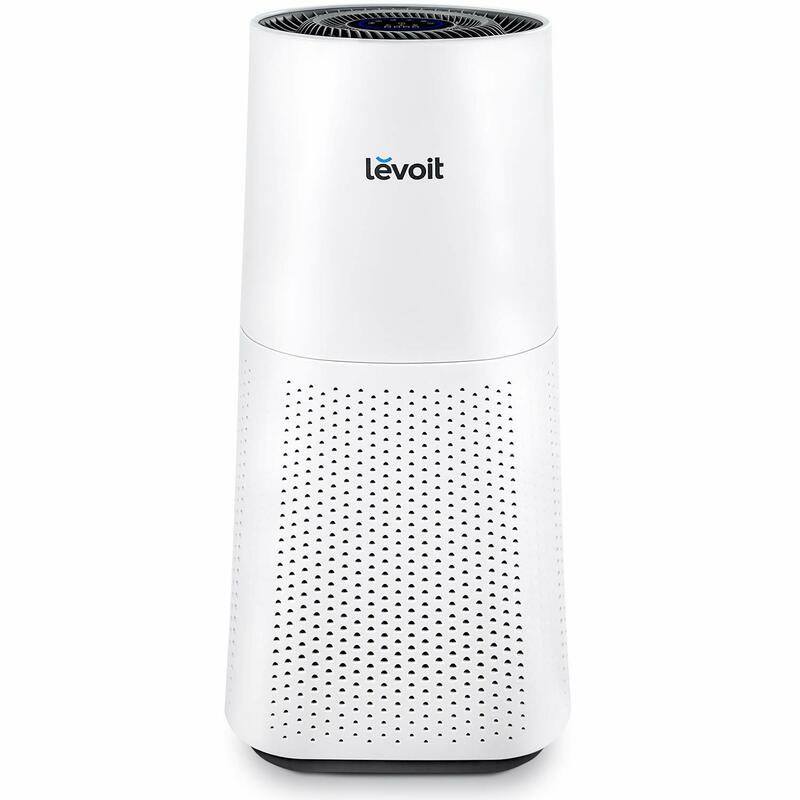 The Levoit LV-H134 is Levoit’s attempt at making a powerful air purifier that’s capable of rivaling the top of mid-range, especially the Blue Pure 121– currently the undisputed king of mid-range tower devices. Thanks to the valuable feedback on the previous Levoit LV-H133, Levoit has made an air purifier that is far outsize the opponent, from both the appearance and the room coverage. In our today Levoit LV-H134 Review, we are going to find out if this 2019 flagship is truly a memorable monument that marks another successful year of this brand. With flagship air purifiers becoming more expensive, thanks to the increasingly high air pollution level, no one is expecting the upcoming Levoit LV-H134 to come at such a great price as an ideal antidote. After the consecutive success of many air purifiers, it is clear that Levoit is now aiming at a very ambitious goal. In our Levoit LV-H134 Review, we will see what can Levoit achieve if it goes all-out with top-end tech and high-end specs. The Levoit LV-H134 is one of the first flagship air purifiers of 2019 and it starts the year off with quite a show. A giant size of 32 inches, room coverage of 710 sq ft and a new set of air filters mean this isn’t the kind of air purifier we normally expect from Levoit. Just say bye bye to the previous low-range army, as since the LV-H133, Levoit has designed the true “flagships”. The air purifier was announced on January 27 and by that time, it was already listed for sale on Amazon. The Levoit LV-H134’s price is now confirmed to be $399. Typical of Levoit, the price represents good value of money. Each of the bigger version will have an addition of $100 compared with the previous model. With that price, the Levoit brand has approached the level of high-end air purifier brands, which are currently dominated by Rabbit Air and Blueair. We could expect more from this brand soon, as the refresh cycle of Levoit LV-H134 is much shorter than the LV-H133. Our review for the LV-H133 indicated directly that the Levoit air purifier can’t hold the ground with the Blue Pure 121, so the company finally decided to decrease the initial price, making this LV-H133 as a primary opponent of Blue Pure 211. And then we have the Levoit LV-H134 with 710 sq ft room coverage, that is ready to head on any air purifiers at the same price range. Obvious alternatives still include the Blue Pure 121 and, if you don’t mind a decrease on the fan power, the Honeywell HFD360B. Right now, it has just been a week since we touch our hands on this Levoit LV-H134, but we promise to update the review whenever we notice anything abnormal. But hey, out of the 1-week test, here is the deal of Levoit LV-H134. Levoit LV-H134 Large Room Air Purifier for Home with True HEPA Filter, Air Cleaner for Allergies and Pets, Odor Eliminator for Smokers. Designed in California. 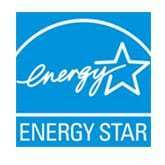 100% ozone free, does not use ions which produce trace amounts of measurable ozone. For large room up to 710 sq ft. I would consider 2018 a strong year for air purifier design, and it seems the trend will move onward 2019. Most of the popular air purifier brands dare to change the usual design for a better appearance, which we can tell a few names like Honeywell with Honeywell HPA030B, Guardian Technologies with GermGuardian AC9200WCA, or Rabbit Air with their great Rabbit Air MinusA2. And to be honest, most of the new designs are getting positive feedback. Levoit previously attempted to steer away from the notch with the LV-H133. As a brand with consecutive improvement on design, clearly the Levoit LV-H134 will replace the predecessor with a new coat. Personally, I believe the result is noticeably better. Instead of a classic cylinder shape that once a symbol of Levoit air purifiers, the Levoit LV-H134 features a gigantic size, with much bigger bottom than anything else in the market. This solid foundation guarantees to hold the 32-inch air purifier stand on the ground with no problem. This height makes us feel the huge Blueair Pro L is still a little smaller than this Levoit LV-H134. It’s a clever solution, as with such height like this Levoit LV-H134, a same tower design as Honeywell HFD360B will be fallen easily. In my opinion, this design will likely be replicated numerous times in the coming months, by many other Chinese air purifier brands. From the previous LV-H133, the company brings in an incomplete 360 Degree air intake concept, which is now perfect in the 2019 Levoit LV-H134. This air purifier still uses the the same cylinder filtration layer that maximizes the 360 Degree air intake efficiency. Though the concept is not new, Blue Pure 121 and Blue Pure 211 both did it long time ago, the Levoit LV-H134 does it better than the predecessors with air intake grills in 4 facets. Now, with the true 360 Degree air intake, the Levoit LV-H134 can truly run the bottom-to-top air flow system. With its design, a Levoit LV-H134 resembles the $749 AIRMEGA 400S more. Still, it’s an attractive display with bright color, and a neat outlet air grill on top. A brand new LED Display with touch screen is available again in this air purifier. The Levoit LV-H134 is so bold and eye-catching, it may well be too much for some tastes. With a weight of 30 lbs, it’s not a small air purifier, but which flagships are? The most important criteria to decide the power of one air purifier is its air filters. Basically we will look at how many filters it has and what types of air filters are used. As a flagship of one brand, I had high expectation for the Levoit LV-H134, especially when this air purifier still keeps the same 3-stage air cleaning system as the predecessors. Pre-filter – Using the fine preliminary filter, Levoit LV-H134 is able to capture most of the large objects right at the first stage of its air filtration process. In addition, the pre-filter is vacuumable and can be reused for a long time. True HEPA filter – Levoit LV-H134 uses a True HEPA Filter to reduce 99.97% of as small as 0.3 microns allergens, virus particles, pollen, and bacteria particles. 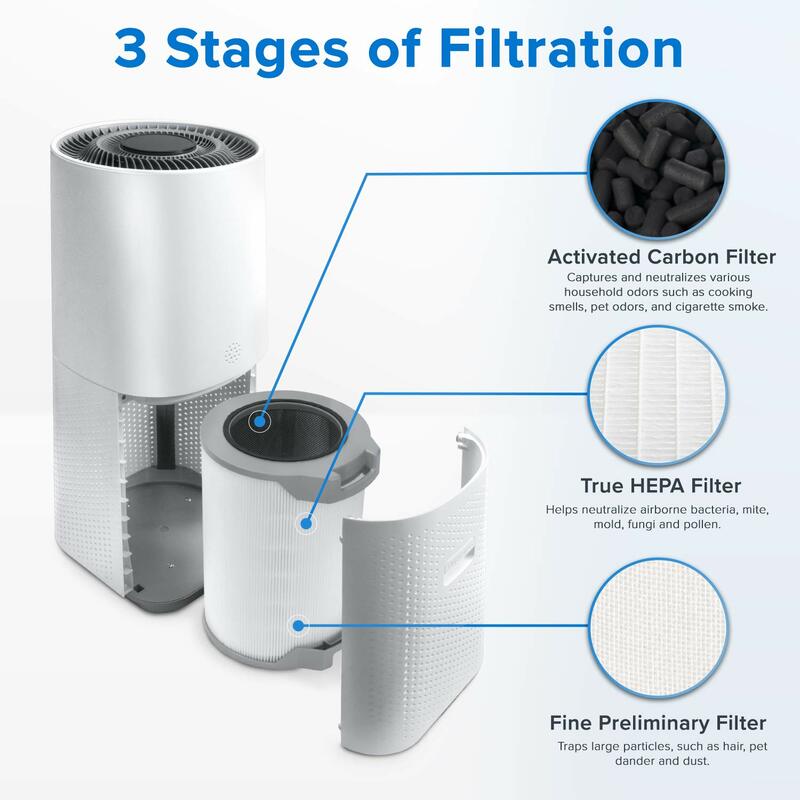 Activated Carbon Filter – This Activated Carbon filter tackles smoke and odors from the kitchen, your pets, or even the outdoors. Upgrade from the already great LV-H133, the main thing you’ll notice about the Levoit LV-H134 is the new air filters. The new LV-H134-RF sets many improvements since the evolution of the already successful LV-H133-RF air filter, with a sturdy build and real power inside. It’s hard to convey the usefulness of all this power for the average user, one who might not care about the efficiency after all, but it will keep your Levoit LV-H134 to deal with a larger room. At its core, Levoit LV-H134 serves a True HEPA filter, which finally help the air purifier to be similar in performance to the Blue Pure 121. In fact, with a bigger size, this True HEPA filter improves the efficiency a lot, thanks to the smart design. But that is only in theory, and in Breathe Quality, we only believe in the performance test. This time, I can drag the Blue Pure 121 out of our garage, along with the GermGuardian AC9200WCA to be the testing samples for my Levoit LV-H134. I run all of them in a room of 400 sq ft for 1 hour without interrupting, and the result is, at last, great for Levoit. Blue Pure 121 is still the most powerful with a high efficiency of 99.95% for any particles that are as small as 0.3 microns, but the Levoit LV-H134 can also deal with 99.93%. For a space of 400 sq ft and only 1 hour running, the result is just incredible. The GermGuardian AC9200WCA with a weaker fan, can only has efficiency of 96%. In terms of out-and-out power though, this is the most powerful Levoit air purifier I’d ever benchmarked when it launched. But that only the improvement in the air filters, and the Levoit LV-H134’s fan speed won’t help you notice its power in day-to-day use. Levoit has been rapid enough for years – but people are starting to expect even more and more from their devices. Next time, I wonder what will be inside the Levoit flagship (I don’t mention the Smart Wifi connectivity, it seems the upcoming Levoit LV-PUR131S will have this feature). Looking at the price difference between Levoit LV-H134 and LV-H133, you can somehow guess the actual air filter replacement cost of this air purifier. Amazon set the price at $79, and I bet the original price is no less than $90. Comparing the raw cost, the LV-H134-RF air filter is really staple, as both the Rabbit Air BioGS 2.0 and GermGuardian AC9200WCA are the same $79. However, this True HEPA filter can only last for 6 months, while the Rabbit Air BioGS 2.0 can last for 2 years, or at least the GermGuardian AC9200WCA lasts for up to 8 months. So if you are looking at the annual filter cost, Levoit LV-H134 is actually not so good. The Levoit LV-H133 has done a great job at jumping to the mid-range room coverage level, and the Levoit LV-H134 can push that level a lot farther. That being said, the room coverage of Levoit LV-H134 is 710 sq ft, which is even better than the great Blue Pure 121 with 620 sq ft or Rabbit Air BioGS 2.0 with 625 sq ft. However, due to the tradition of Levoit air purifiers with insufficient fan power for the room coverage, I don’t expect much in the Levoit LV-H134. 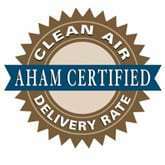 One thing I want to remind you, many air purifier brands are using the room coverage as the criteria to advertise. You need to look at the ACH/CADR rating to decide the fan power of this air purifier (the fan power, not the air filter’s quality). The ACH of Levoit LV-H134 remains 4X. This Levoit LV-H134 will clean your room every 15 minutes. The CADR of Levoit LV-H134 is 312 cfm in general. With that CADR rating, there is no need for any air purifier knowledge to know that this Levoit LV-H134 air purifier is not great enough at dealing with 710 sq ft. It is certainly indicated in the manual of Levoit LV-H134, to assure you to run this air purifier in a room much smaller than 500 sq ft. The CADR rating is used to tell how fast one air purifier can clean a room, and if you want to try your Levoit LV-H134 in a 710-sq-ft room, it will take you long time than normal. Levoit is an advanced brand in keeping the noise level and power consumption of an air purifier as low as possible. The sacrifice is simply the fan power. Even for a giant air purifier like Levoit LV-H134, they keep the same 3 fan speeds to handle a quiet operation. I recorded the noise level at the lowest setting only 32 db, which is lower than the library noise level. Even at the highest setting, the Levoit LV-H134 maintains at only 54 db. Yes, you can notice the sound, but it is just the same as the level of normal conversation at home. Thankfully, the Levoit LV-H134 has a handy Smart Sensor to keep the fan speed mostly at the lowest setting. If you plan to run this air purifier in quiet places, you will be happy. With that low CADR rating, this Levoit LV-H134 needs more time to clean a large room. Also, a good air purifier is designed to run for a long time to be more efficient, making the high-priority question in Breathe Quality is: “Do air purifiers use a lot of energy?” To know the answer, we will need to check the power consumption of this air purifier. For this criteria, we can all believe in the Levoit brand. An advanced fan power of Levoit LV-H134 allows this gigantic air purifier to run with a power consumption of only 45W. This power consumption is still far behind the maximum of Blue Pure 121, which is up to 61W. That is the exchange we have for this Levoit LV-H134, a little bit weaker fan power for a little bit better power consumption. 45W is truly low for a large room air purifier, and if you buy this Levoit LV-H134, you only need to pay for up to $17 annually, with about 8 hours of use per day. Yes, I know it is so low that most people will ignore this power consumption easily. The LV-H133 has moved all the Smart features from the Levoit LV-PUR131, and again, the Levoit LV-H134 do exactly the same. With a great Smart Sensor, which is a laser dust sensor, Levoit LV-H134 can detect the real-time air quality and give feed back to you with high accurate. Moreover, this Smart Sensor allows the Levoit LV-H134 to adjust the fan speed automatically based on current air quality. The original Sleep Mode is used widely, as it keeps the air purifier operate at the lowest setting for your night time. And don’t worry about the Advanced Timer or LED indicator for filter replacement. These functions are now more and more popular in the modern air purifiers, at a rate that even the under $100 air purifiers can have them. 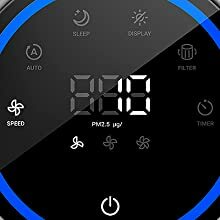 Levoit still doesn’t add the Smart connectivity to their air purifiers. The upcoming Levoit LV-PUR131S, which is a Smart version of the air purifier with same name, is predicted to contain these features, and we will review both this device and the function of their app. But for now, you should forget the Smart connectivity in this Levoit LV-H134. The 2019 flagship of Levoit brand is not just huge outside, its inner ability to cover a large room is impressive. This Levoit LV-H134 is again one of the best power-reserved devices, with good to no sound at all. Personally, I love the Levoit LV-H134, and I believe that the company is doing the right things to improve their products better. Should I buy Levoit LV-H134? Yes, this is the best air purifier you can get from this famous brand. This air purifier is powerful, has high performance and strong fan power to deal with an extra large room. If you have serious allergies or asthma to airborne pollutants: the Levoit LV-H134 is the best thing you can get for the price, or you can consider the Blue Pure 121 or Whirlpool WPPRO2000. If you want a better performance, or better fan power to clean your room faster: you should check the Blue Pure 121 or Whirlpool WPPRO2000, as it has higher CADR rating than our Levoit LV-H134. 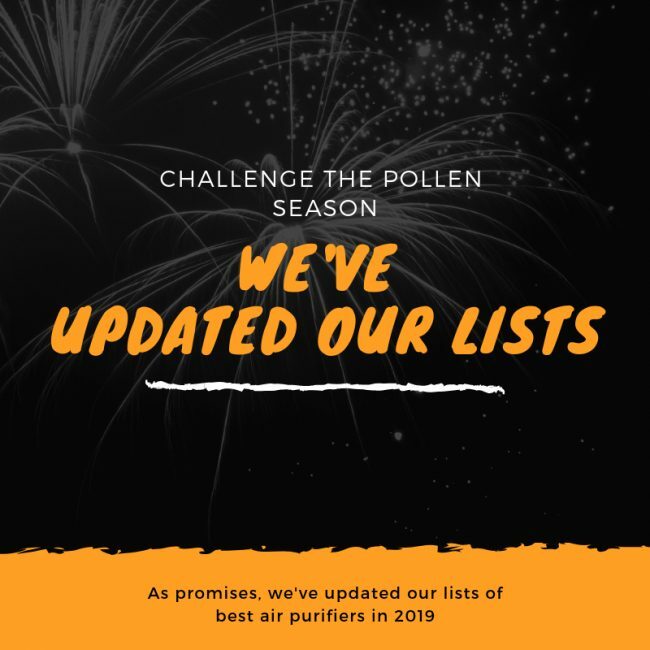 If you need an air purifier with a better room coverage: you can choose the Alen BreatheSmart 45i to cover a room of 800 sq ft. Or you should upgrade to the Oransi Max for a room coverage of 1100 sq ft. If you need a budget version of this air purifier: you can choose the Levoit LV-H133 or Blue Pure 211 instead. If you need a more silent air purifier: the Levoit LV-H134 is really silent and you don’t need to look for others. If you care about the annual filter cost and energy cost: the Rabbit Air BioGS 2.0 is a greater option for the energy cost and annual filter cost. If you love the additional features: you had better pick one in these Winix NK105, Winix QS, Winix HR1000, Blueair Classic 205 and Honeywell HPA250B for the Wifi capability function. Nothing to say for the first flagship in 2019, Levoit LV-H134 is just fantastic.